Salem's Fort Lee is a historic resource that for many other American communities would be a priority for preservation efforts, and even a destination for heritage tourists. However, in Salem, a community with the mixed blessing of having more nationally and even internationally historic resources than most, Fort Lee has been somewhat lost in the shuffle. Thankfully, the Friends of Fort Lee have come together to help steward the property. Fort Lee is significant for being one of the few Revolutionary War period earthwork forts in Massachusetts to survive relatively intact. Throughout the Revolutionary War, it served as a deterrent to the British, even though no notable engagement took place there. During the War of 1812, the fort was reactivated and repaired, but not rebuilt or substantially altered. During the Civil War, some changes were made in order to accommodate four heavy guns, but the majority of the fort went unaltered. Fort Lee was transferred to the federal government in 1867 and then deeded to the City of Salem in 1922. The City took the land on as a public park and has maintained it as such to the present. During the American Bicentennial, the site was cleared and interpretive signs were installed. Subsequently, all of the signs were removed and the site became substantially overgrown. 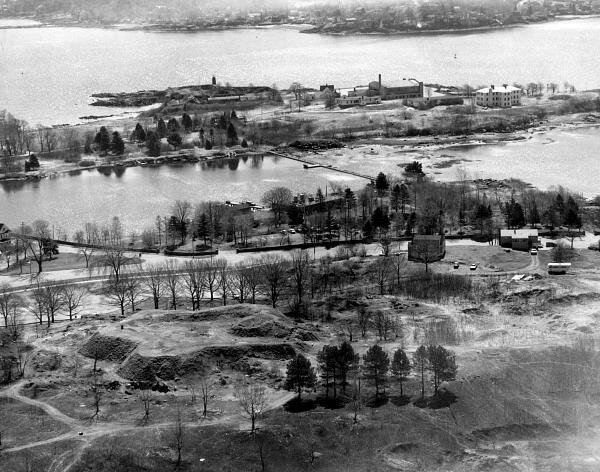 A historic photo showing Fort Lee looking toward Winter Island. In 2014, Boy Scouts Troop 24 organized a community effort to clean up Fort Lee and organize the Friends of Fort Lee. That March, after receiving approval from Salem Parks & Rec, 67 volunteers cleared all major Fort Lee trails, removing over 1,200 pounds of trash and 7 abandoned tent sites. Much more work remains to be done at the site. Clearing of brush would uncover and re-establish old oak and willow trees and provide an open-water view from Obear Park/Beverly Harbor to the islands, Marblehead Point, Winter Island Peninsula and down Salem Harbor. A new interpretive plan would provide education and foster awareness and appreciation of the site. Fort Lee is a unique historical and archaeological resource, and it should be preserved as a potential future data set, and as a marker of Revolutionary American history. ​If you are interested in getting involved, reach out to the Friends of Fort Lee.